There are SPOILERS for Solo below, so read ahead at your own risk. Solo: A Star Wars Story may have just dropped a major clue that Game of Thrones creators David Benioff and W.B. Weiss are working on a Knights of the Old Republic trilogy of movies. In Solo, an Easter Egg has been found that refers to Exar Kun in Dryden Vos' headquarters. One of the exotic artifacts on a table has been confirmed by Lucasfilm to be from the Sith Temple of Exar Kun, which has many Star Wars fans incredibly excited because that means that Kun is now officially canon. The Art of Solo: A Star Wars Story book by Phil Szostak reveals that an extravagant table in Dryden Vos' office has a large chunk of obsidian on it with hieroglyphics engraved in it. As it turns out, that stone came from a very interesting place in Star Wars history. This new discovery leads directly to the Knights of the Old Republic. The entry in the book reads. "The central desk, which represents the administrative seat of his power, is a bespoke piece of furniture. The stone base, that Dryden has plundered from the Sith temple of Exar Kun, is made from polished obsidian and decorated with carved hieroglyphs representing spells that protected its former home." Rian Johnson is currently working on his own Star Wars trilogy, but it has been reported that the films won't have anything to do with what has been released thus far in the franchise. Jon Favreau's TV series will take place after the events of Return of the Jedi and before The Force Awakens, so that counts that project out as well, which means that Game of Thrones creators David Benioff and W.B. 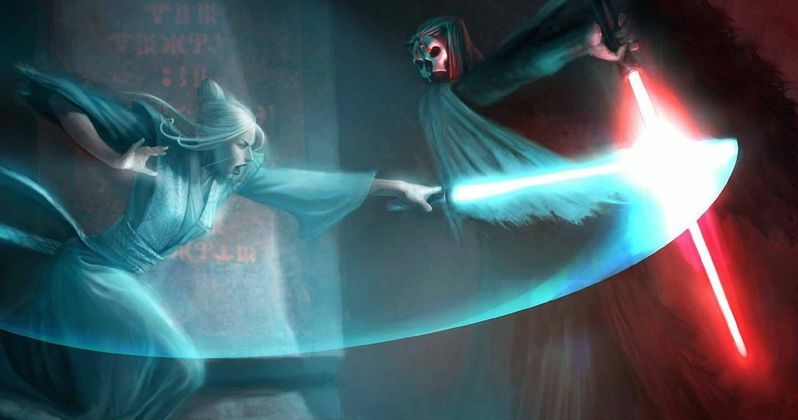 Weiss could very well be making a Knights of the Old Republic movie. Benioff and Weiss are the perfect team to take on the ancient Star Wars story and introducing Exar Kun as official canon in Solo may be the clue pointing in that direction. Exar Kun is the Jedi Knight who fell to the dark side and as a result, became the Dark Lord of the Sith. Kun waged war against the Galactic Republic and Jedi during the Old Sith Wars. He was taught by Jedi Master Vodo-Siosk Baas, and while he was a student he came across forbidden knowledge of the history of the Sith, according to Wookieepedia. Exar Kun was extremely confident in his abilities and became obsessed with learning about the history of the Sith, soon becoming all consumed. While nothing has been officially confirmed by Lucasfilm, a Knights of the Old Republic film series could be exactly what David Benioff and D.B. Weiss are going to be cooking up. Game of Thrones and Solo star Emilia Clarke was recently asked about what Benioff and Weiss are up to in regard to their secret Star Wars project and while she doesn't know anything, she revealed that it will be unlike anything we've ever seen before, declaring that it will be "Star Wars on acid." Exar Kun's story sounds like a good fit for the Game of Thrones creators, so let's hope that this theory works out. You can get more information about The Art of Solo: A Star Wars Story over at StarWars.com.